Our backyard after the water receded. It's not often that little Rhode Island leads the national TV news broadcasts but we managed to do just that with the insanely heavy rains and floods this week. Here's a little multi-media action that hits close to home for us...literally. The street in front of our house had foot-deep rapids yesterday and about three-quarters of our backyard was submerged under a couple of feet of water. The best gage of the depth is my neighbor's picnic table, the seats of which were almost under water. By this morning most of the water had receded and my neighbor's picnic table was usable again, thank goodness. Big chunks of the neighborhood pavement have washed away, though, leaving us here to wade through the swamps. Luckily, though, this all just a hassle and everybody here seems okay. 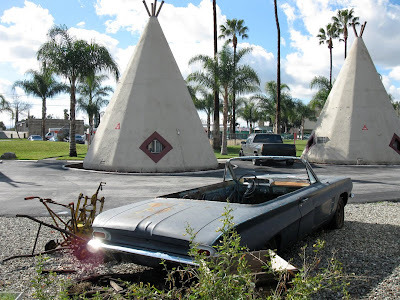 While we're still in this Route 66 Rialto-Fontana, California neck of the woods, I would be remiss if I didn't include another awesome eccentric road sight right nearby. 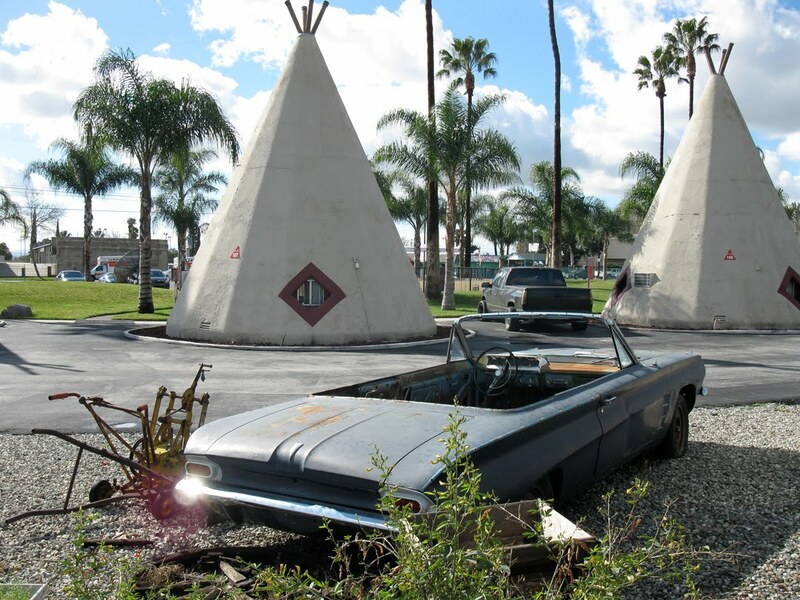 I'm no authority on Googie architecture, but I do believe the above structure is called a butterfly. And a beautiful butterfly at that, with a deep neon "V" cleaving the front of the place right down the middle. If you're above a certain height, I imagine you have to tilt your head to one side if you're standing in the center of the room. 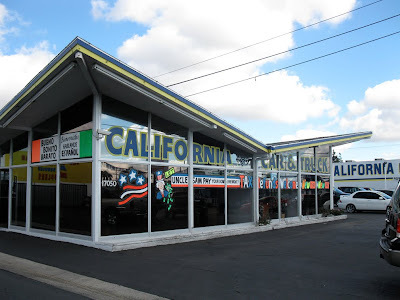 How appropriate, too, that this is a car dealership as cars, California and Googie go together like butterflies, butterfly nets and something else having to do with butterflies. 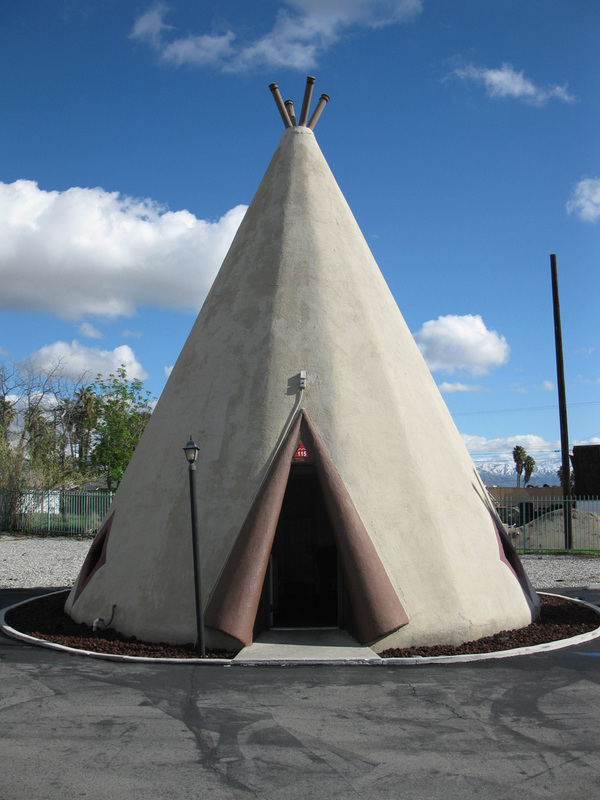 Jay Bono, a retired lawyer, took over the family restaurant business after his mother died in the 1990s. 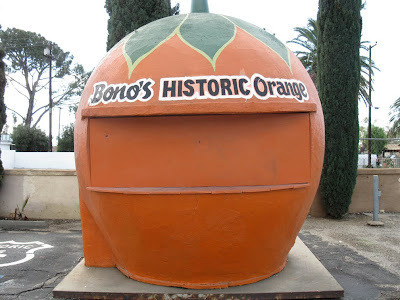 More than 10 years ago, the Fontana Historical Society, of which Bono is a member, got word that a stand three miles east was going to be destroyed. The society moved it to a Wal-Mart parking lot, then Bono paid to have it moved to the parking area of Bono's Restaurant and Deli, where it still sits, restored but unused. This could change. 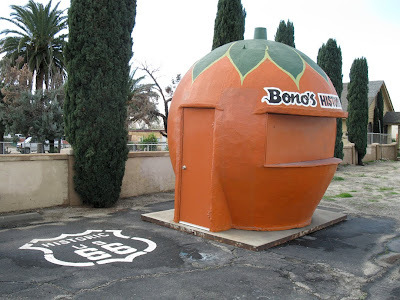 Bono has been remodeling the restaurant, adding a wine bar among other changes. He also has plans for the orange. 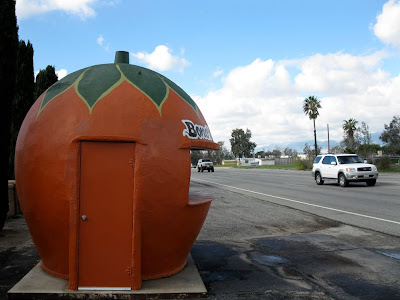 "When I reopen this stand, I think I'm going to sell OJ out of it, like an Orange Julius," he said. 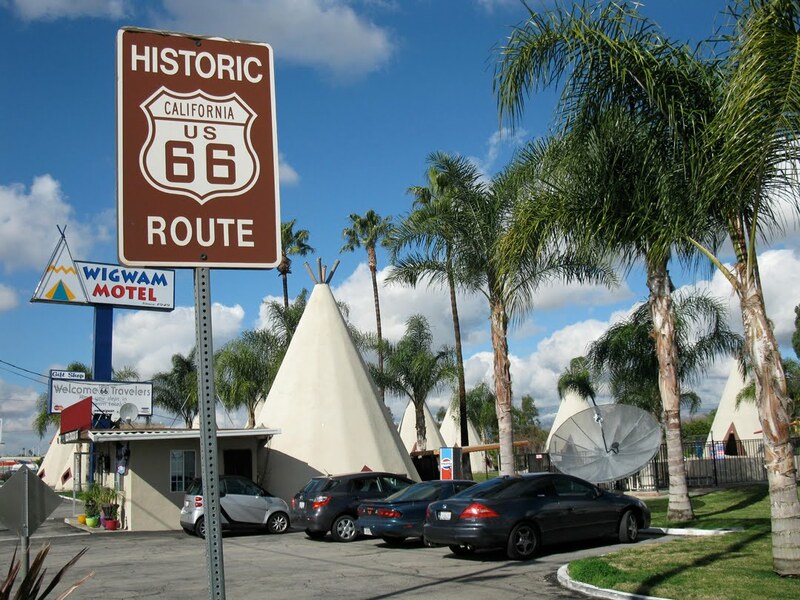 Even unopened, the stand is a merry reminder that you are driving down the awesomest road of them all, Route 66. I'm sure glad places like this still exist, orange you? One of the true icons of old-fashioned roadside travel are the wigwam motels found in the south and southwestern USA. 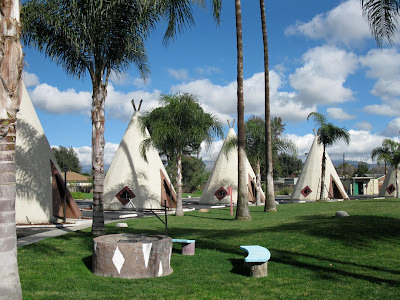 The brainchild of a Mr. Frank Redford, a total of seven wigwam village motels were built, beginning with his group of teepee-shaped cabins arranged in a court near Horse City, Kentucky in 1937. 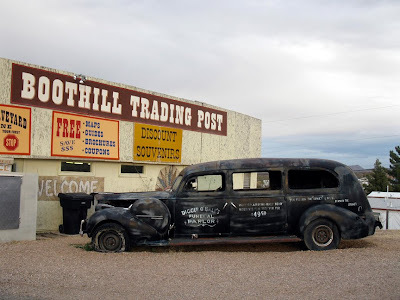 Today three well-preserved villages remain open for business in Cave City, Kentucky, Holbrook, Arizona and Rialto, California. We were lucky enough to pass by Rialto's Route 66 location on a spectacularly sunny day last January. This is what eccentric roadtrips are all about: blue skies, the old highway, and a motor court full of 52-foot tall faux-Native Americana. I had heard this location had fallen on hard times and had a sullied reputation but that couldn't have been further from the truth when we arrived. 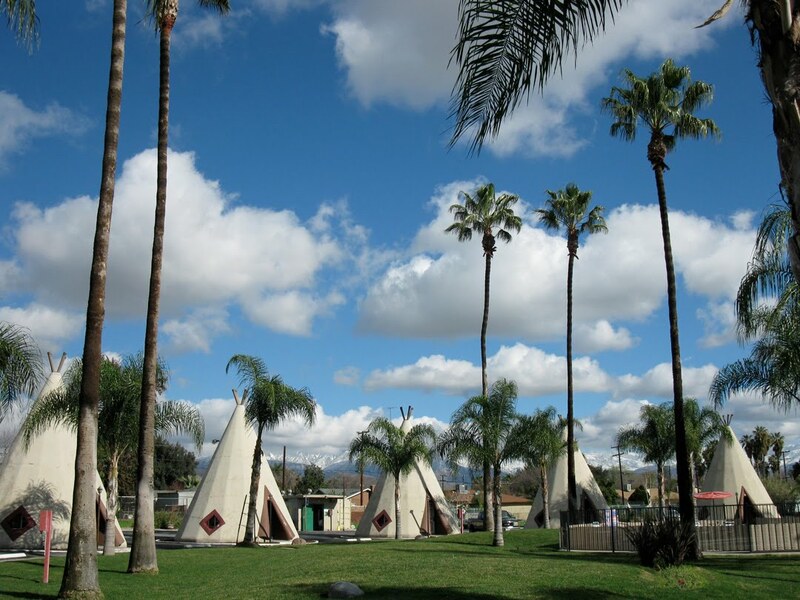 The place sparkles as if it had just been built. 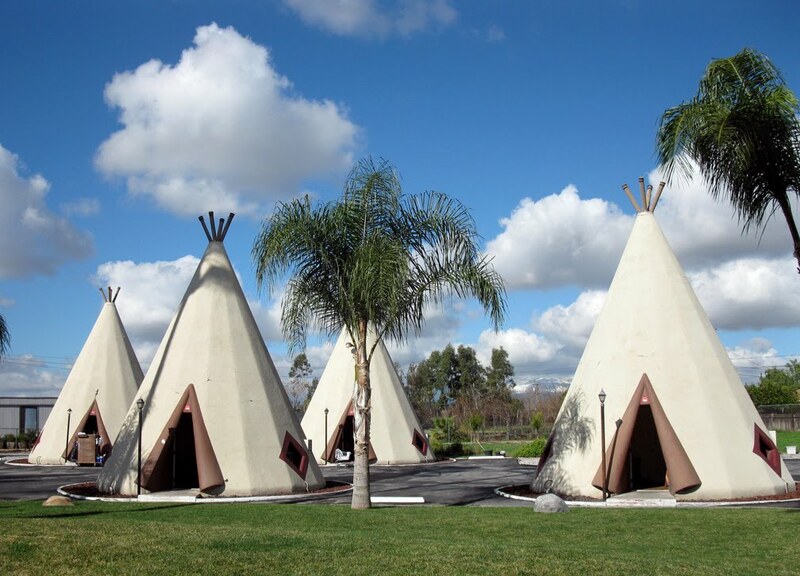 The teepees are nicely appointed with flat-screen TVs and modern door locks. 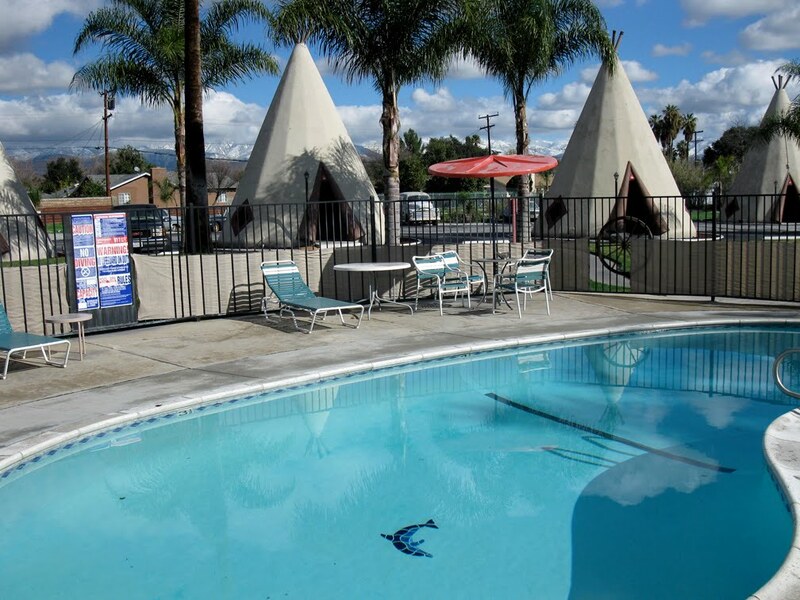 A kidney-shaped pool gleams, and an office with souvenirs and a friendly staff await you. God bless the people who own these places and keep them alive...let's give them all a 'wam round of applause. 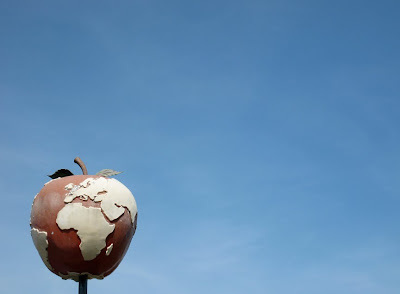 Over-sized apples are big along here. Two separate businesses offer 3-D fruit to "tempt" passers-by. 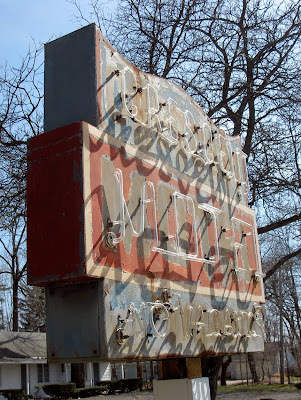 I love when old signs like this are left to decay into an art form all their own. 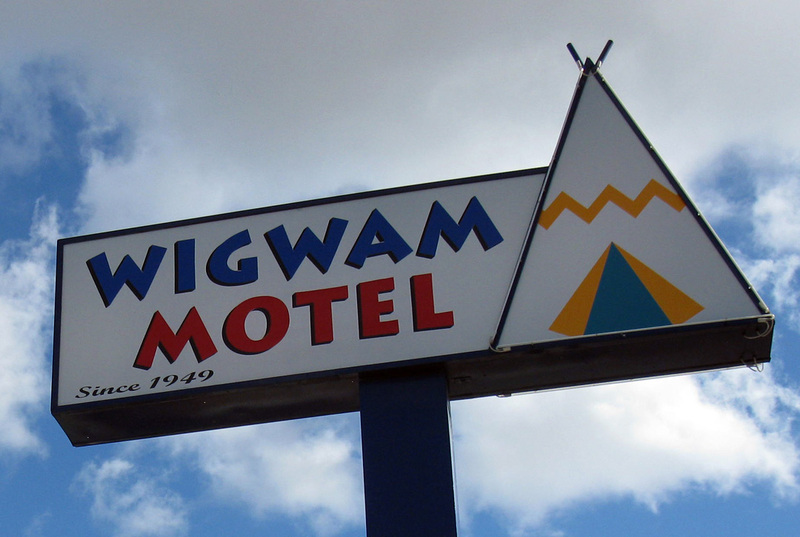 A classic 1960s sign with a classic 1960s name. The owner of this place told me the town wants him to take down this sign because of their sign ordinances. Shame on them! Luckily, he's grandfathered in. Lovely, well-maintained neon, turned on even during the day time. 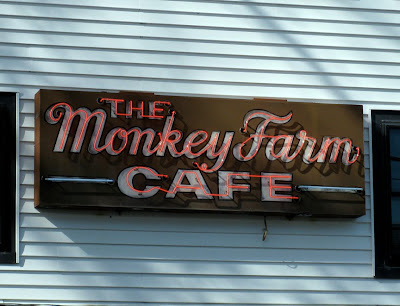 Reminds me of the cafe in "The Postman Always Rings Twice." 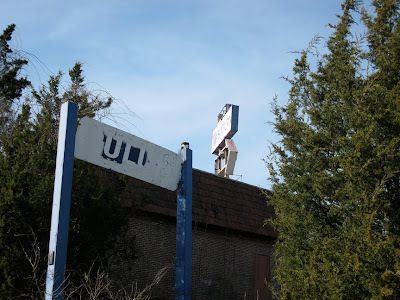 This was a dead sign for a steak house that was revitalized by a Saturn dealer. Then Saturn went kaput and now it's dead again. 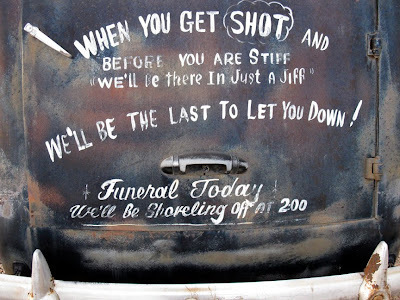 Ashes to ashes. 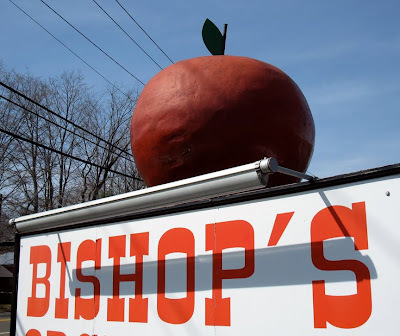 We're Connecticut natives, so it's always nice to get back on our Nutmeg State home turf. 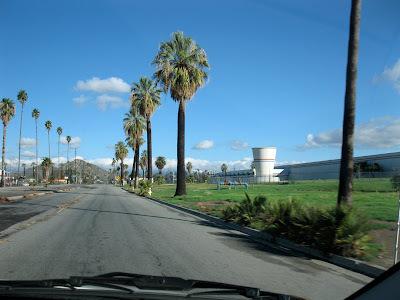 It's great to get off the interstate and see the old main roads, when time allows. 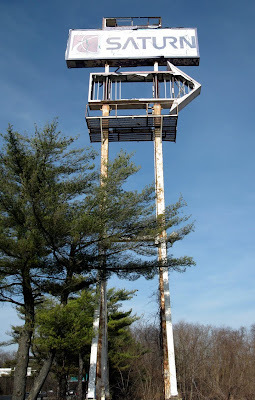 We went for a splendid ride along Route 1 between Branford and New London and saw some awesome road signs, in states of both repair and disrepair. 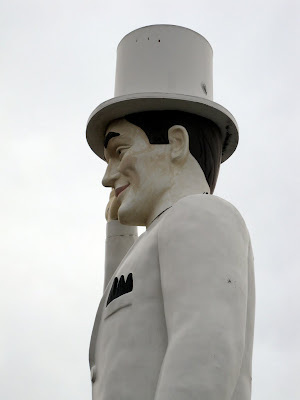 This stretch Route 1 has a lot for the eccentric roadside attraction fan to see...a Conn.-siderable amount, I dare say. 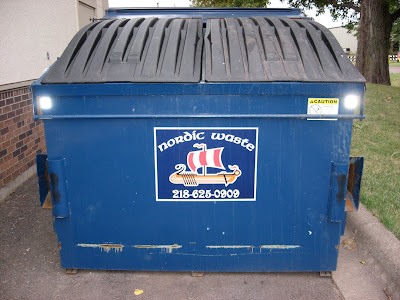 A Viking theme seems appropriate for chilly Duluth, Minnesota. 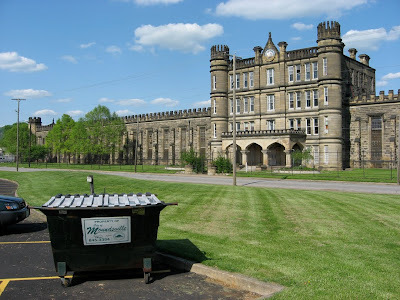 Moundsville, West Virginia has a mighty fine dumpster parked between the Grave Creek Mound (they don't call it Moundsville for nothing, you know) and the former state penitentiary. 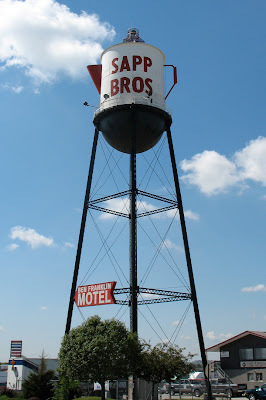 ...while the tiny town of Leith, North Dakota offeres a homegrown approach while pitching in lock, stock and barrel. First, the obligatory puns: These places provided an offer I couldn't refuse. Therein lies the rubbish. Yes we can. 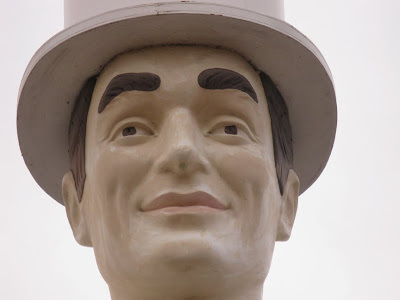 I'm making a receptacle of myself so let's put a lid on it. Sometimes when you're on a roadtrip, every little thing seems interesting and the mundane becomes "fundane." 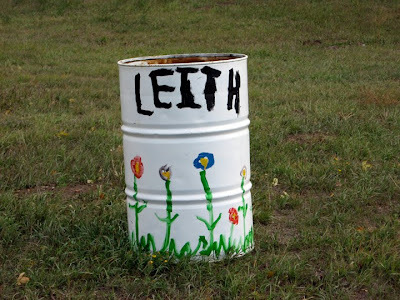 Even a dumpster can be a source of whimsy or regional pride. 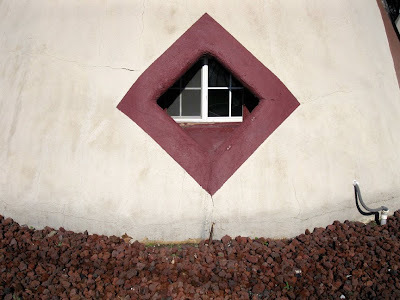 These are a few that caught my eye, and as the great Archie Bunker once said, if you don't like it, lump it, take it down the road and dump it. 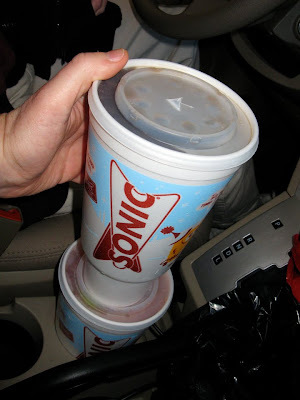 We were so inspired by the big Riverside cup that we ordered the biggest drinks money could buy at a nearby Sonic drive-in. 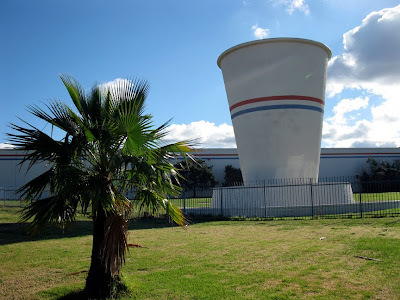 We saw another eccentric roadside "world's biggest" milestone in Riverside, California recently: a place that claims to have the world's biggest paper cup. 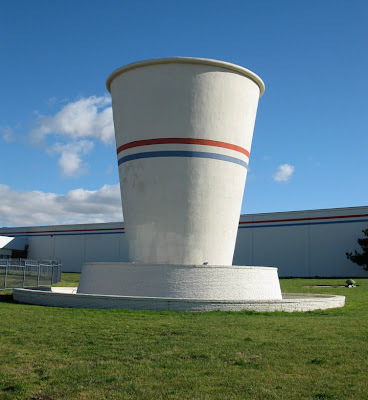 It's not actually made of paper and, for all we know, it might not even be the world's biggest non-paper cup, but it's still gi-goondus and a sight to behold. 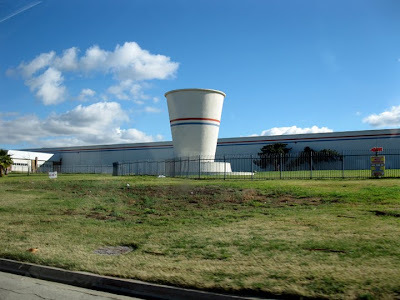 As recently as 1999, the Sweetheart Cup Company was located here at 800 Iowa Avenue. Back then, the distinctive Sweetheart logo was featured on the side of the cup, providing three-plus stories of quality brand recognition for all passersby. No mistaking what was being manufactured in this here plant. Years later, Sweetheart pulled out and a furniture liquidation company moved in circa 2005. They had the good taste to leave the cup standing (or a lack of funds to get rid of it). Apparently, no attempt such as "A heaping cupful of savings on sofas and love seats!" 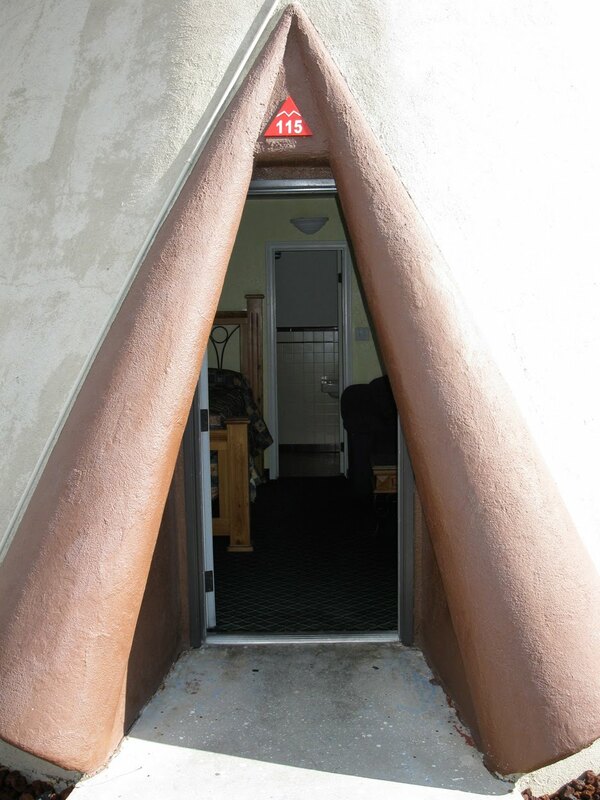 was made to cash in on their newly acquired architectural anomaly. 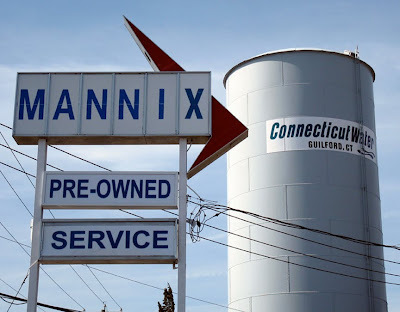 When we stopped by last January, the building appeared to be vacant (the "for lease" sign out front was a dead givaway), but the cup still stands. It's plain and surreal, with a fence around it to protect it from cup-ransacking hooligans. 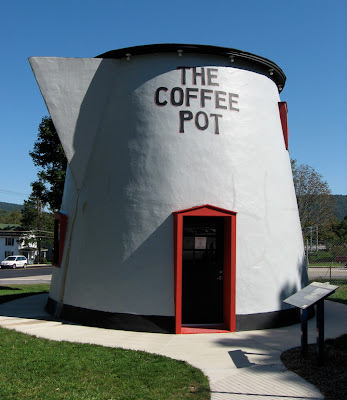 Let's hope the future tenants keep the cup alive, or barring that, donate it to another cup-friendly eccentric roadside attraction elsewhere. 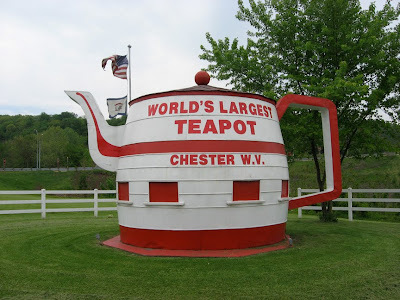 That would be just my cup of tea. 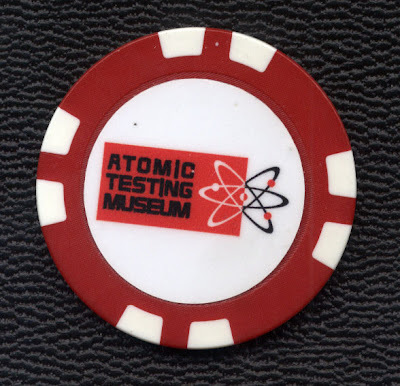 I did a post some time ago about the incredible Atomic Testing Museum of Las Vegas, Nevada, and it is a place that is not to be missed if you're a non-gambling eccentric roadside attraction fan. A prized memento of that stellar trip is the poker chip I purchased in their superior gift shop. 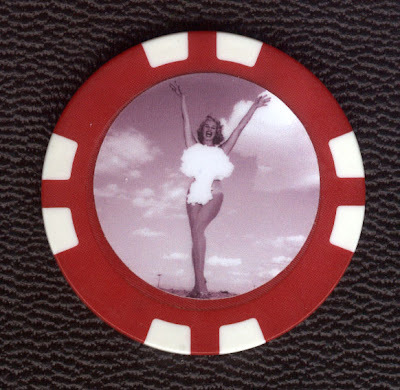 Poker chips make great Vegas souvenirs because they're small, inexpensive and very Vegas-y, baby. But this isn't just any souvenir poker chip. Emblazoned on this fine keepsake is Miss Atomic Bomb. 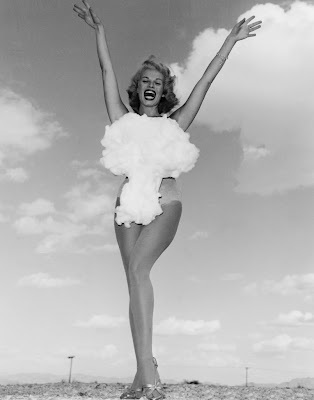 Back in 1957, a photo shoot was concocted to honor the atom bomb being tested in Vegas, and who better to do this than a pretty showgirl decked out in a cotton-ball mushroom cloud explosion swimsuit. But who was Miss Atom Bomb? 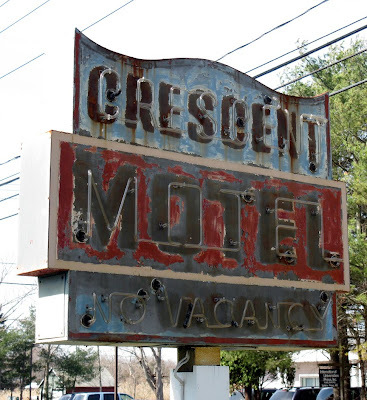 A Mr. Robert Freidrichs of the National Nuclear Security Commission has been searching for Miss A.B. for some time and has compiled some impressive data. He's determined her to most likely be Lee Merlin, a 1950s Vegas model who, if she's still alive, would most likely be in her early seventies today. Check out this website, conelrad.com, for more of the explosive details. If anyone out there in Eccentric Roadsideland has seen her, or if you're tuning in now, Miss Merlin, drop us a line. You da bomb. 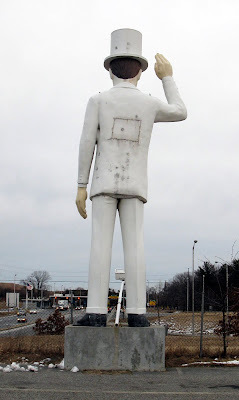 A tall, nattily-attired roadside giant greets you as you exit the Massachusetts Turnpike for Route 291 in Chicopee, Massachusetts, near Springfield. 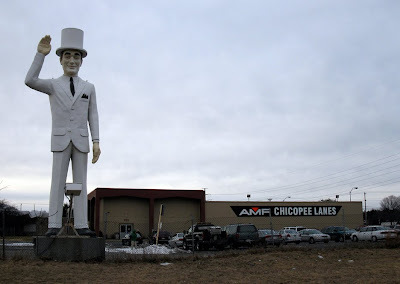 Some checking on the always helpful roadsideamerica.com informs us that in a former life, this gent was an Uncle Sam from a Ford dealership who was given a new, ivory-colored wardrobe and a change of venue in front of the Plantation Inn, whose catchphrase is "Southern Hospitality in New England." 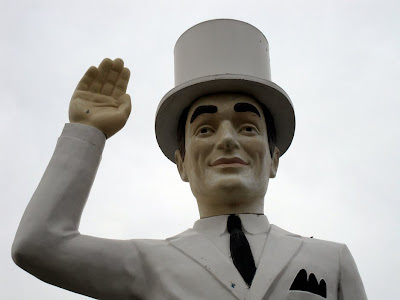 And what, may I ask, could be more hospitable than this Kentucky colonel sublimely grinning and giving you a friendly "Howdy" the minute you get off the Mass Pike? One might argue that pre-Civil War southern plantations aren't the best metaphor for hospitality, but I digress. 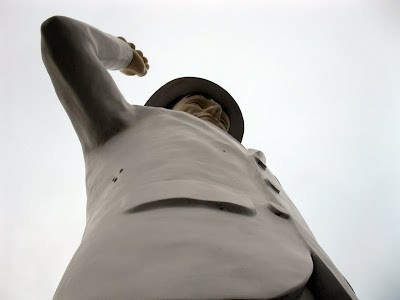 It's hard to tell if Big White Guy is really the Plantation Inn's mascot, though, as there is no mention of him on their website (not capitalizing on such a draw is a marketing faux paux of no small order). In the mood to bowl a few frames? 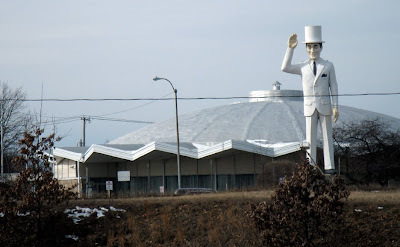 The Chicopee Lanes next door adds to the eccentric retro roadside greatness. If you think this place awesome, all we can say is you got that white. 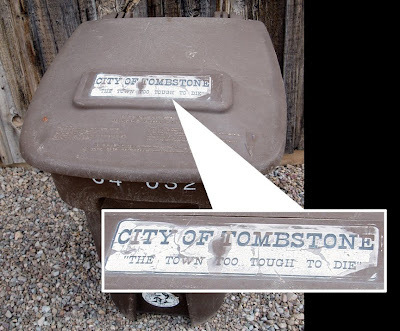 The locals like to call Tombstone, Arizona "the town too tough to die," but if you do die, you'll want to park your carcass at Boot Hill Graveyard, famously known as the final resting grounds of Billy Clanton and the McLaurys of OK Corral shootout fame. 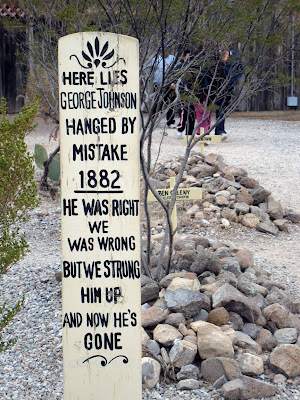 Boot Hill is also famous for a couple of grave markers that feature a bit of gallows humor. 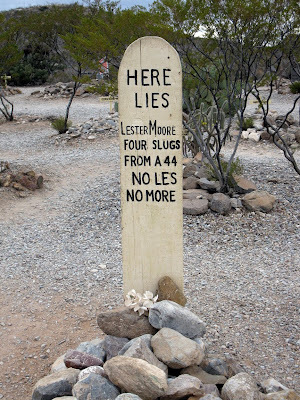 Remind me when my time comes to request a rhyming headstone. 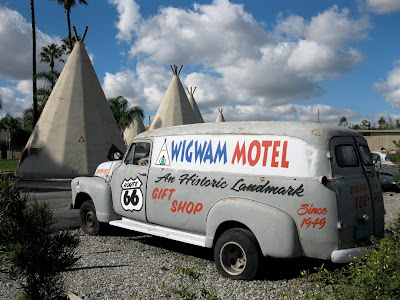 There's also a good tacky gift shop by the graveyard parking lot, with a funky old Packard hearse parked out in front. 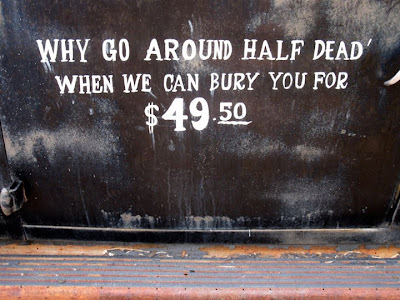 On it are painted more deathly witticisms. 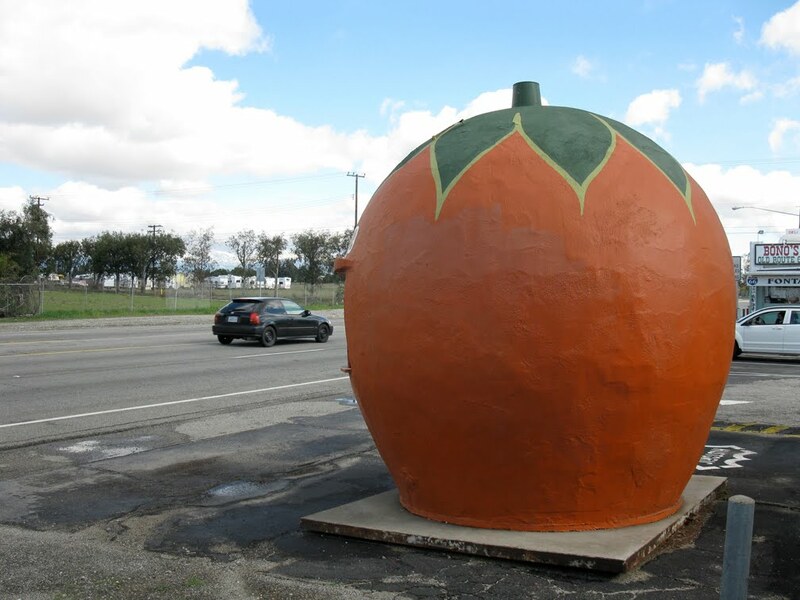 Should the eccentric roadside attraction fan pay a visit? Of corpse.